The Orthodox Clergy Association of Southeast Texas held a Town Hall Meeting at St. George Orthodox Church in Houston, Texas. 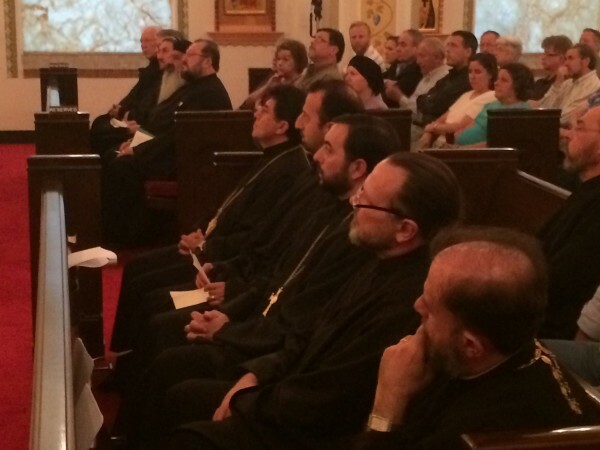 On Friday evening, September 5, 2014, The Orthodox Clergy Association of Southeast Texas held a Town Hall Meeting at St. George Orthodox Church in Houston, Texas (with rector The Rev. James Shadid), titled “The Silent Holocaust—The Persecution of Christians in the Middle East.” The press release following the event reported that all of the Orthodox, Coptic and Syriac Christian communities in the area participated—approximately 300 persons, including 16 priests. Jurisdictions represented were the Greek Archdiocese (GOA), the Antiochian Archdiocese, the Russian Orthodox Church Outside of Russia (ROCOR), the Orthodox Church in America (OCA), the Serbian Diocese of Midwestern America, and Coptic and Syriac Dioceses. There were four speakers, including Hieromonk Bashar (al-Shamany) of the Syriac Orthodox Church. Originally from Mosul, the he spoke about the current situation in the Middle East. Father Bashar’s family are currently among the thousands of scattered refugees. A question and answer period followed, and a large collection was taken for the IOCC’s relief work in the Middle East. At the conclusion of the Town Hall, all of the Orthodox clergy offered up the Trisagion Prayers for those who have died. Listen to the audio of this event on Ancient Faith Radio. Listen to the Arabic presentation by Fr. Bashar Al-Shamany, Syriac Priest from Mosul, Iraq, of St. Ephrem the Syrian Church of Houston, posted separately at the same link, or alone here.